A new report from the Department for Children and Families shows that even as the department added staff to manage heavy caseloads, the number of reports of abuse – and the number of substantiated cases – continued to rise. The increase was so significant, DCF Commissioner Ken Schatz said Wednesday, that social worker caseloads are now higher than they were before the department added 18 new social worker positions last year. The “2014 Report on Child Protection in Vermont” shows data about DCF’s growing caseload last year, including the increased reporting of neglect and abuse, the rise in substantiated abuse cases, the types of abuse and the relationships between victims and alleged perpetrators. The report doesn’t address which, if any, of the changes was influenced by reforms at the department that added capacity and increased information sharing. Schatz said he doesn’t have data on how the changes affected DCF’s work, but the deaths of two young Vermonters, Dezirae Sheldon and Peyton Geraw, last year did spur change. The number of reports to the state’s Child Protection Line reached a record 19,288 last year, up more than 10 percent from 17,460 in 2013. While that number isn’t necessarily indicative of increases in the number of abuse cases, it shows more Vermonters are going to DCF with concerns. Schatz said that increase isn’t a bad thing. “We encourage that, because in some respects it’s a good thing to encourage members of the community to identify circumstances where children may be at risk,” he said. Of those 19,288 reports, DCF conducted 2,908 child abuse investigations and substantiated the allegations in 652 cases, meaning “the evidence would lead a reasonable person to believe the child was abused or neglected,” the report said. That’s a smaller increase than the increase in reports – just 10 more substantiated cases, or 1.5 percent above 2013 numbers. 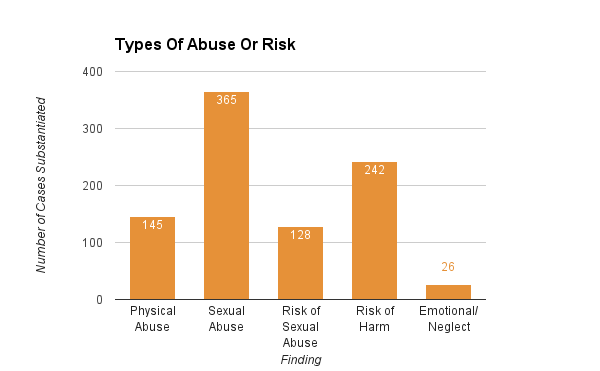 Each of the 652 substantiated cases of abuse or neglect was determined to be at least one of these types of abuse or risk, but some cases were substantiated as more than one type of abuse. 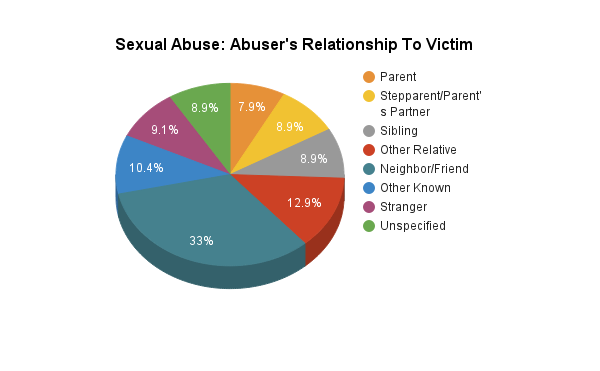 The majority of those substantiated cases included sexual abuse (365 cases), but officials noted in the report that allegations of abuse can be substantiated in more than one category, so some cases may have involved both sexual and physical abuse for example. In cases of sexual abuse, DCF seemed to do a better job of catching abuse before it occurred when the child was at risk of abuse from parents. Of the substantiated reports in which a parent was listed as the abuser, 105 were substantiated for “risk of sexual abuse.” There were 31 cases in which parents actually committed the alleged abuses. The most cases of actual sexual abuse -- as opposed to a risk for sexual abuse -- took place when the abuser was a “neighbor/friend” of the victim and not a parent. There were 130 such cases compared to 31 cases where a parent was the abuser and 35 when a stepparent or the parent’s partner was the abuser. A new report from the Department for Children and Families showed that there were 365 cases of substantiated sexual abuse against children in 2014. Overwhelmingly, the perpetrators of sexual abuse were male. Of all cases of sexual abuse in 2014, 93 percent of abusers were male. The department has options other than a full child abuse investigation after receiving a report. In 2014, DCF launched 1,688 child abuse assessments -- in which no formal finding is made regarding the allegation -- and 1,281 family assessments which “may be used for allegations that don’t meet the legal definition of child abuse or neglect but still raise concerns about whether children are receiving proper parental care necessary for their well-being,” the report said. Vermonters were angered by the homicides in 2014 of two toddlers under state supervision, Dezirae Sheldon of Poultney and Peighton Geraw of Winooski. The tragedies led to several investigations and external reviews, which called for significant changes to Vermont's child protection system. Vermont’s Department for Children and Families has hired Jennifer Burkey to head up its Rutland District office. Burkey will be the fourth person to hold that position in less than a year. Burkey is spending her first 3 to 6 months working alongside Interim District Director Beth Sausville. Sausville has been splitting her time since January heading up both Rutland’s and Bennington’s District DCF offices. Vermont Department for Children and Families officials repeatedly refused to comment on Burkey’s hire, nor was she available for comment. The Department for Children and Families is failing to meet three key federal guidelines for how it handles cases of at-risk children in the state, according to the top official in charge of the department’s family services branch. Vermont’s continuing problem with opiate addiction has led to a rise in the number of children in state care, officials say. The recent surge is driven largely by children under six years old, a trend that has officials scrambling to find foster families to meet the needs of younger children.